There is an immeasurable amount of buzz surrounding the new Winnipeg Jets, and next season, the organization's first season back in the National Hockey League A contributing factor into the hype of Winnipeg's re-acquisition of an NHL team is the presence of young star Evander Kane. 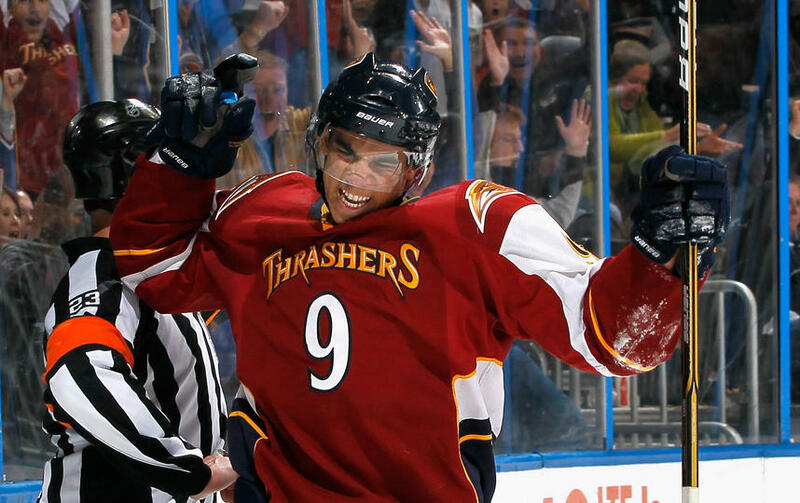 Kane was drafted fourth overall, by the Atlanta Thrashers in the 2009 Draft, and jumped right into the league at just 18 years old. He found his stride right out of the gates, hitting the back of the net 14 times, helping him reach 26 points in his rookie campaign. But would Kane fall victim to the dreaded sophomore slump? Quite the opposite. Kane's point totals nearly doubled, grabbing 43 points after scoring 19 goals and registering 24 helpers. At just 20 years old, the 6' 2" Vancouver native, has played in over 65 games in both of his first two seasons, and has flown under the radar on the national level. The fact that Kane is not more known around the league could be due to the market he has played in since coming into the league. Well all of that will change come early October. Playing in "Hot-lanta", Kane's physicality and offensive skills have gone unnoticed, likely walking down the street on his off days and being seen as just another guy. This reality will evaporate very quickly when the move to a hockey crazed city like Winnipeg takes place. This lime light should add gasoline to Kane's fire, and push him into his development as one of the league's best. Going into his third season, the 195 pound left wing, has plenty of room to grow and become an elite power forward. However, where most big bodied players in the NHL fall short Kane excels, displaying the offensive skill and mindset that could set him apart from the rest of league and make him one of the top forwards in the NHL. How Kane responds to his new found star status in Winnipeg will determine how his development progresses. Seriously though, what would a young player like more than a new found fan base that will thrust him into the lime light? Kane should grow significantly next season, and the Winnipeg crowd will prove as major catalyst to his development. He'll need that support if he wants to continue to wear Bobby Hull's number 9. He may wilt under the pressure of a "hockey crazed" city and media! While ATL might not have been a great hockey town one could live a semi normal life without the scrutiny of the media. Only time will tell. Sour Grapes atl fan. Playing in front of a arena with more butts in the seats then empty seats should fire these guys up. Team should still be in ATLANTA, NOT winnipeg, they will leave there within 5 seasons for sure !!! Bring them back to the Philips with new solid owners !